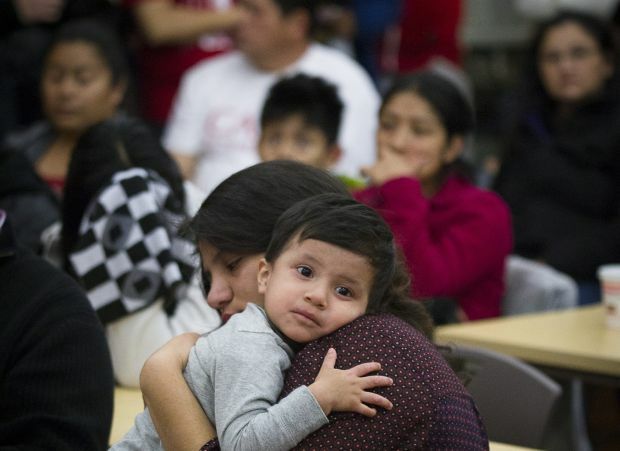 WASHINGTON (CNS) — It will be several months, at least, before anyone can apply to take advantage of immigration policy changes announced by President Barack Obama Nov. 20. Some aspects will go through the federal rule-making process, which requires a formal advertising and comment period that could take a year or more. Others are simply a matter of spreading the word through various federal agencies about new priorities and policies. Still others will mean setting up procedures, websites and staffing to handle potentially millions of applicants. Immigrant assistance organizations such as the Catholic Legal Immigration Network caution potential beneficiaries of any of the new programs and policies to be wary of anyone offering legal advice or help applying for things that aren’t yet available. CLINIC and 19 other religious, legal, civil rights and union organizations are collaborating on something called the Administrative Relief Resource Center, www.adminrelief.org, which has information for potential applicants, legal service providers and communities that want to provide assistance to immigrants. CLINIC also has on its website, www.cliniclegal.org, a schedule of trainings for those who want help applicants. — Expansion of deferred deportation that could affect more than 4 million people. — Revised priorities for who will be deported. — The expansion of a provisional waiver that will allow more people to apply for legalization without leaving the country. — Broader definitions of who may qualify for certain waivers, known as “parole,” from immigration agency requirements. Those will affect relatives of military personnel and some people with pending immigration cases who wish to leave the country for a short time. — Streamlining of visa procedures for foreign students and graduates of U.S. universities and other applicants for technology or other highly skilled jobs. The process to apply for expansion of deferred deportation for the parents of U.S. citizens and green card holders will likely be rolled out by spring, according to senior administration officials who briefed reporters before Obama’s announcement. The largest group of beneficiaries is likely to be more than 4 million immigrants without legal status who have a U.S. citizen child or one with legal permanent residency, commonly known as a green card. Those children can be minors or adults. Applicants will need to have lived in the U.S. for more than five years, supply proof of various aspects of their history, go through a background check and pay a fee. Successful applicants of what is being called Deferred Action for Parental Accountability, or DAPA, will be granted relief from deportation — as long as they stay out of trouble — for three years, which may be renewed. Just as did recipients of Deferred Action for Childhood Arrivals, or DACA, on which this expansion is based, successful applicants will be issued Social Security cards and work permits. The program will not confer any real legal status, nor will it entitle recipients to bypass rules for legalization and citizenship. DACA also will be made available to people who arrived before 2010, a change from the current date of 2007. Applicants will no longer be required to be under age 31. Renewals and new recipients of DACA will be good for three years, instead of the previous two years. A reprioritizing of who Immigration and Customs Enforcement chooses to deport will mean enforcement will focus on criminals, those who are thought to be threats to national security and those who are picked up at the border. Those changes should take effect quickly. Likely to take the longest — a year to 18 months — according to the administration officials, will be three types of changes to the rules: those covering who is granted parole to leave the country before they have been approved for legal residency; for who is given permission to remain in the U.S. under “extreme hardship” provisions; and changes meant to streamline visas for entrepreneurs, graduates and highly skilled workers.